Body image doesn't discriminate gender or age. Yet its importance to our health, both mental and physical, is vital. A negative body image in childhood can lead to a lifetime of struggle and self-doubt. In today's image-conscious world it is important that we help children and youngsters feel better about their bodies. No Body's Perfect is designed to do just that. Written for therapists, teachers, counsellors, parents, and carers it promotes positive body image and good mental health using easy to implement evidence-based strategies. It is appropriate for use with children aged six years and up and features stories and examples from children, young people, parents and teachers of both genders, different cultural backgrounds, and a range of ages to help inspire and engage. how to be media literate. Dr Vivienne Lewis is a clinical psychologist and body image expert with over 15 years experience as a researcher and clinician. She specialises in working with children, young people and adults with body image issues and eating disorders and has seen her clients improve their lives through using the strategies in this book. Dr Lewis has also consulted with many schools to assist in their promotion of a body image friendly environment for not just children and young people but also for teaching staff. This is her second book. She published -Positive Bodies: Loving The Skin You're In', a self-help book for adults and young people of both genders struggling with body image issues. At the University of Canberra she has run and researched a positive body image group program for women as well as training Clinical Masters of Psychology students in how to work with people with body image issues and eating disorders. She presents her research and clinical work at international conferences and is a regular speaker for media informing the public about psychological science in an easy to understand manner. Dr Lewis is significantly involved with the Australian Psychological Society and runs the ACT Mental Health Professionals network special interest group on eating disorders. She is passionate about her work, celebrating body diversity and acceptance and practices clinically in Canberra, Australia. Question: Why did you write No Body's Perfect? Dr Vivienne Lewis: I wrote the book to assist parents, carers, teachers and other helpers to role model and promote positive body image in children and young people. There are few resources out there to assist with body image and it's a growing concern in our youth with it being the top concern for those aged 12-25. Poor body image can start early and lead to life long struggles with body and self image. Body dissatisfaction is also related to poorer mental health and wellbeing. Question: Was there a specific age you wrote No Body's Perfect for? Question: What is the main message you hope for readers to take from No Body's Perfect? Dr Vivienne Lewis: That as adults we are responsible for the next generation's mental health and well being and the strategies in this book are designed to do just that, help us educate and encourage positive body image and wellbeing. Question: How important is a parents own body image on their children? Dr Vivienne Lewis: It's critical that adults role model positive body image in the language they use and behaviours they display. Children are great observers of adult behaviour so lead by example. Question: Can you provide some of the feedback you've had from No Body's Perfect? 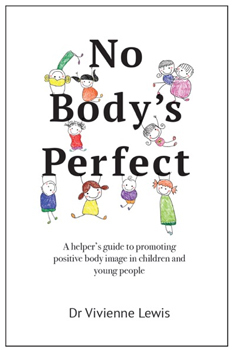 Dr Vivienne Lewis: Teachers, parents and health professionals have said that this book comes at a critical time when body dissatisfaction is becoming more apparent and adults need simple strategies as to how to help children and young people. This book is easy to read, has many strategies for use in and out of the home and school. It is an essential resource for any adult caring for children.